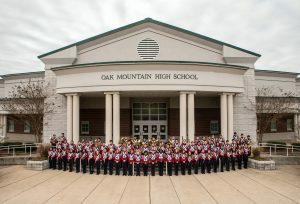 The Oak Mountain Symphonic Band consists of seventy ninth through twelfth grade students at Oak Mountain High School. Membership in the band is determined by individual audition. Under the direction of Dr. Travis Bender, the ensemble performs a wide variety of genres in the high school wind band repertoire. Notably, this ensemble frequently performs newly published compositions for wind band. Under the baton of Dr. Bender, this ensemble has only received adjudicated ratings of superior at all contests and festivals. Since the school’s inception, the Oak Mountain Symphonic Band has twice been invited to perform at Carnegie Hall in New York City. In the spring of 2016, the Symphonic Band was invited to perform at the Music for All National Band Festival in Indianapolis. The Oak Mountain Symphonic Band will be performing at the 2019 Alabama Music Educators Conference in Birmingham, Alabama in January 2019.